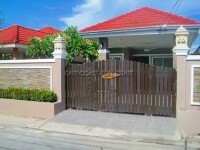 This modern property is located in a quiet suburb of East Pattaya. It provides convenient access to North Pattaya. Very close to Motorway-7 you are able to get into Pattaya center in less 10 minutes!!! The house has 3 bedrooms, 2 bathrooms, one being en-suite spacious living room and a European kitchen. There are 3 air conditioning units, hot and cold water, reserve water tanks, water pump.The house also has its own small private garden. Nearby are many local Thai markets, convenience stores and small restaurants. The village features 24 house security, a communal pool, Lake Feature with gardens and a children’s play area.